Trabzon (formerly Trebizond) is in the Eastern Karadeniz region of Turkey. A major trade centre since times immemorial, and visited by Marco Polo among many others, Trabzon is today one of the major cities of Turkey's northeastern coast. In medieval times, city served as the capital of Empire of Trebizond, which was ruled by Komnenos family —which also provided several emperors to the Byzantine throne in Constantinople. The longest surviving rump Byzantine state, Trabzon was captured by Ottoman Turks in 1461, almost a decade after the fall of Constantinople. Frequent Dolmuş connections inside the city: 1.75 Lira. If you want to go from Trabzon's otogar to Atatürk Alanı, cross the main street and flag down any dolmus with the direction "Meydan". The city dolmus station is under a bridge on the south side of Atatürk Alanı. Dolmus leave from here also to Boztepe viewpoint and to Aya Sofia (ask around and they will point you to the correct dolmus). For general tourist information, the tourist office is located right on Atatürk Alani square, on the southern side. The clerk speaks English very well and provides you with a wealth of information about Trabzon and its surroundings. Before doing anything in Trabzon, go to the tourist office. Hidirnebi Plateau (Hıdırnebi Yaylası). Beatiful place in Trabzon, Akçaabat. Altitude of 1200m. There is natural beauty. xxkm form Akçabaat, 40km from Trabzon. Transportation is provided by private car or tour. Grocery store, bakery, butcher, there are picnic area in Hıdırnebi . There are guided vehicles for transportation. The ride take 35-40 minutes. Uzungöl, a lake up in the mountains 99 km from Trabzon, 19 km from Caykara and at an altitude of 1090 m. A great number of broken rocks from the slopes filled up Haldizen stream and Uzungöl was formed in this way. The lake is 1000 m long, 500 m in width and 15 m in depth. It is surrounded by forests. Uzungöl has an interesting view with the village houses around it. And there are some other small lakes on the mountains which are 15-20 km. from Uzungöl. The lake is also surrounded by convenient tracks for hiking. There are some facilities such as bungalows and some establishments which rear trout. Tourism agencies organise tours for the day in the summer. You can use local transport to go to this place: From Trabzon's regional dolmus station (5 min walking downhill east from Atatürk Alanı) there are busses (Çaykara Tur) to Uzungöl via Of and Çaykara about every 75 min (e.g. 11.30am, 14 TL, at least 2h). Tickets can be bought from Çaykara Tur's small office (Sanayi, Yalı Cad. / ayışık Sok. D:7, its a side street from Martı Hotel). In Uzungöl the bus stops at a teahouse, which also serves as Çaykara Tur's office in Uzungöl. At the tea house check for the return schedule to Trabzon (and Of) (14 TL, about 2h, usually at 1.30pm, 3.45pm, 4pm, 5.15pm, 6.30pm). In high season it might be wise to buy your return ticket when arriving in Uzungöl (or already in Trabzon), if you intend to go back to Trabzon the same day. The seats for the afternoon buses might sell out quickly and you might have to wait for the last evening bus. If you ask the driver he will also drop you at Trabzon's otogar. Important information: The monastery is closed due to some several restoration and field works should be open again in 2019. It is possible to go there and to have a look from outside (what is still worth), but you cannot enter the monastery. A few tours start with minibuses from Trabzon in the morning. If you want to go on your own by public transportation (might be more expensive than joining a tour!) you can go to the regional dolmus station (5 min walking downhill east from Atatürk Alanı). There are frequent dolmus to Maçka (e.g. around 10am), which may continue all the way up to Sümela monastery (from Trabzon 60 TL return for 1-2 pax, less when you find more people going to Sümela and you use your bargaining skills; waiting time max 1h, what is more than sufficient, since the monastery is closed). A taxi from Maçka would cost 70-80 TL return. Sümela Monastery (Turkish: Sümela Manastırı; Panagia Soumela, "Virgin Mary of Soumela" in Greek) is a spectacular rock-hewn monastery perched dramatically on the narrow ledge of a steep cliff in the forests south of Trabzon. It was built in the fourth century, just before the Roman Empire split into east and west, by two Athenian priests, Barnabas and Sophronius, who, according to legend, found a miraculous icon of the Virgin Mary in a cave. 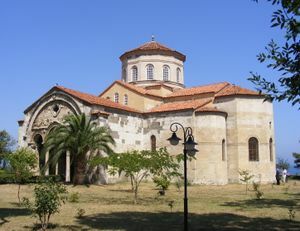 The monastery's location in this geopolitically tumultuous corner of the globe naturally saw times of trouble and fell into ruin numerous times throughout its history, with its most thriving times falling under Byzantine and Ottoman rule. The twentieth century, however, was not kind to the monastery. It was abandoned following the chaos and inter-ethnic violence at the end of World War I, and the population transfer of Trabzon's (formerly Trebizond) Greek population to Greece. Its remote location gave it some sanctuary, but its frescoes still attracted the occasional casually hurled rock by a bored shepherd. The beautiful frescoes today suffer from decades of heart-wrenchingly pointless vandalism by travelers—judging from the various alphabets and names scrawled across these impressive religious works of art, it appears that just about every culture in the world has taken part in the desecration. The buildings themselves have been fairly heavily restored in recent decades, as the Turkish government has stepped in to protect the monastery and to turn it into a museum. Admission is 15 TL. The simplest way to get to the monastery is by tour, and you can find a tour in town by just asking any other traveler there (no tourist visits Trabzon without seeing Sümela). The monastery lies close to Maçka, about 30 km south of Trabzon, and those preferring to get to the monastery on their own means instead of taking a tour can get to Maçka by taking minibuses heading for Gümüşhane, Erzurum or other destinations south from Trabzon. The rest of the way, approximately 17 km to the actual site of monastery, can be done by dolmuşes from downtown Maçka (although only in high-season and not during off-season), which will take you to the entrance of Altındere National Park (Milli Park). Then, the monastery is about half an hour walk away, which can be done through a forest trail, which was recently widened in order to cope with the ever increasing numbers of visitors, or along the tarmac road leading to the monastery. Those approaching with their own vehicles can get as near as 300 meters to Sümela itself, where there is a car-park in front of Hagia Barbara Chapel. There is an additional fee of 20 TL for cars, paid at the entrance of the national park. If you're brave, try traditional Turkish bath (Hamam). The men-only Hamam is right next to Efes Pub; the women-only Hamam is just around the corner. A really great authentic Turkish experience, and the people are very nice and will walk you through everything. 25 TL for a bath (including a scrubbing and massage) at the women's Hamam, and you should also tip your masseuse. You can find a cheap but good place near city center called "Çardak Pide Salonu"
There are only a few restaurants in the center serving alcohol. Among them Bordo Mavi in the garden of clubhouse of Trabzonspor. Thankfully, the popular Efes Pub is right off Ataturk Square, just down the street from the Burger King. They only serve snacks like fries and peanuts, but are open until midnight. Ladies, note that the far half of the bar (partitioned) is for men only. You can ask at the tourist information on Attatürk square (Atatürk Alanı) where they know about different accomodations. At small, but a little bit more expensive hotels, you can also try to bargain a cheaper price than the first one offered to you. The area around İskenderpaşa Cami and Atatürk Alanı Meydan Parkı is full of hotels of various quality and price range. The cheapest hotels are down from Ataturk Square towards the port, but they usually function as unofficial brothels. By European standards the area is safe, however, and the prostitutes quite discreet. Between those hotels, Hotel Erzurum was acceptable and frequented by backpackers. Some of the upmarket hotels in Trabzon are Zorlu Grand Otel and Novotel. Zorlu Grand Otel is in downtown Trabzon, at Maraş Street. Novotel is some distance out of Trabzon, in Yomra (a town close to Trabzon) but it takes only ten minutes from city centre with a car or dolmuş (bus) to get there. Every hour (30min after each full hour) buses (Prenskale company) leave Trabzon's otogar (bus station) from morning to evening to Pazar (14 TL, less than 2h, tickets can be bought on the day of travel) via Rize. The same buses usually continue until Hopa or even Batum(i). From Pazar you can connect by dolmus to Ayder (14 TL, 45min) via Çamlıhemşin during daytime (All information from May 2016). Buses leave Trabzon's otogar for Kars (near the ancient ruins of Ani) at Midnight, arriving 8AM-9AM. A direct bus to Doğubeyazıt leaves at 10PM, arriving 10AM. Ulusoy buses for Erzurum leave at 7AM, 10AM, noon and later in the evening, arriving 5 hours later. 25 TL (Mar 2012). Mid-size buses every hour from Trabzon's otogar towards Torul and Gümüşhane. Last bus in the evening: 8 PM. There are also long distance buses to other major Turkish destinations (e.g. Istanbul, Göreme, Sivas, Izmir etc) but it's a good idea to book these ahead of when you travel. There are many travel / ticket agent shops who can help you with this around Ataturk Alani (the main square in Trabzon). There are many times of couch buses to Batumi per day. It takes about 4 hours. For Uzungöl and Sümela see "See" section.